I was sent a few picture books by Sterling Publishing by surprise early on in December. I kind of ran out of time to review books before the close of the month, but our family has enjoyed them so I thought I would give them a mention. Both of these books are American Museum & Natural History books and are illustrated by Steve Jenkins. Each introduces the young reader to the world of animals. Bold and bright in their color schemes, these books are very fun to look at. 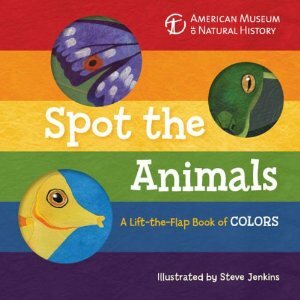 First off, there is Spot the Animals: A Lift-the-Flap Book of Colors . This is a "spot the animal" book - or a peek-a-boo adventure (whichever strikes your young reader's fancy). Apart from featuring a small variety of animals, it also focuses on learning colors. For example, the first page spread asks the question, "Can you spot the red animal?" The page opposite the question has a the tip of a red ghost crab poking out of some grass. This book contains six page spreads and highlights the primary colors that you would find in the rainbow. As I said, this one is bright and cheerful and has been fun for my littlest (age 1 3/4) to peek through. 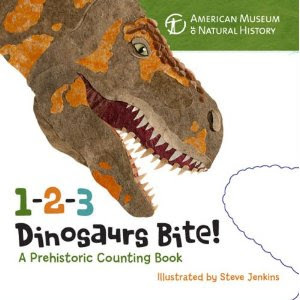 The second title I was sent is 1-2-3 Dinosaurs Bite: A Prehistoric Counting Book . My regular readers around here are aware of the fact that we are creationist. I have a hard time finding books about dinosaurs that do not contain the phrase "millions of years" and so I was instantly speculative upon seeing the cover. Happily, this book being more for babies/very young toddlers, leaves out such speculation and sticks to sharing illustrations of various dinosaurs and teaching the child each dino's name. All of the dinosaurs in this book are believed to be meat eaters, hence the book has several "bites" taken out of it all throughout. The first bite into the book comes from a microraptor, the second from a velociraptor and so on and so forth. By the time we get to the tenth dinosaur there is hardly any book left! Artistically, this book is very intriguing to the young (and older) reader. At the conclusion of the book there is a page which asks the question, "What did these dinosaurs really bite?" There is an answer given for each of the dinosaurs pictured inside of this book. I very much appreciated the fact that the word "may" was used in the various descriptions. Example: "Dilophosaurus may have eaten meat left behind..." etc. Thanks to Sterling Publishing for shooting both of these books my way! Steve Jenkins' books are usually a hit around here. Thanks for the reviews!